An interesting week for Everton with their chairman Dave Whelan stepping down and handing over the reins to his 23 year old grandson. Sadly, they were unable to find a win away from the DW Stadium and a 0-2 defeat to Stoke leaves them teetering on the edge of the “battle to avoid relegation” precipice. Roberto Martinez has been loyal to Wigarton and despite some rank awful defeats, larger clubs such as Evergan will surely come a-knocking in the summer. It is getting a little desperate for Everton. They’ve only just gained enough points to presume full blown panic to be premature but the recent numbers are quite grim. A month or so back, it looked like they were on the road to recovery as they went three games without conceding and picked up 6 points in 4 games, but one point in 4 ties since (and that was at home against Leicester) and we’re back wondering who the heck are that team cutting a swathe through the Europa League? 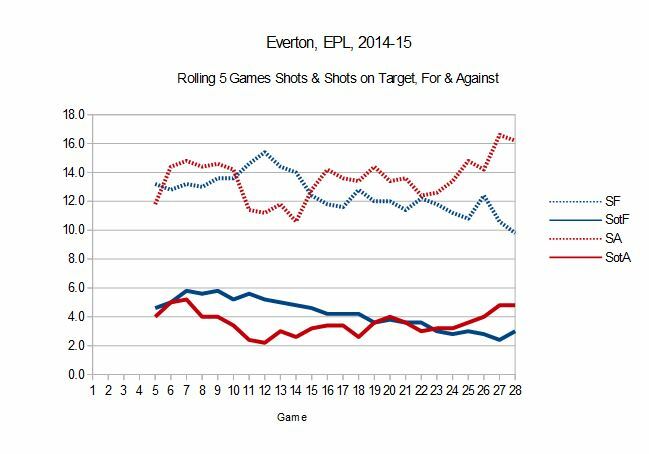 Everton have failed to find the net on ten occasions this season. Nine of these have occurred in the last 14 games. Their raw conversion rate in this period is down at 6%, which is so bad that it’s within handshake distance of Aston Villa, their shot ratios have fallen down below par and their Finishing +/- (PDO) is low, has been low all year and is getting worse. I have noted this before but the team that most consistently posted Finishing +/- scores this bad on a consistent basis was Wigan under Martinez. They survived on more than one occasion despite handicapping themselves on the numbers year after year but as weeks go by and Everton fail to pick up points or score with any regularity, it seems more and more clear that there is something in Martinez’ tactical make-up that causes his teams to do the opposite that say, a Tony Pulis team might. 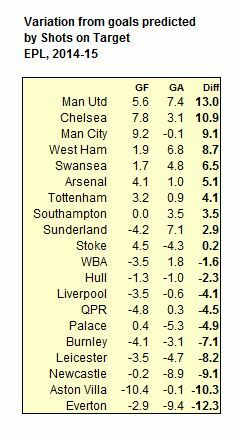 Pulis teams always look rubbish in the stats, yet pick up average points totals. Martinez teams usually look okay under the hood, but the goals, wins and points don’t necessarily follow. The obvious problem for Carver, a horrid 16% goals to shots conceded rate, is unlikely to persist long term but could do with shaping up quickly. His Finishing +/- is not good but has improved / regressed from Pardew’s time and Newcastle are still taking a marginally above par rate of shots. A big 8% drop in shots on target is a red flag of sorts and will need remedying if Newcastle are to do anything other than meander through to May. Nine points in nine games is not great, in fact it’s pretty bad, but the Pardew era left Newcastle comfortably mid-table and pressure is unlikely to be exerted too heavily before tough (read: expensive) boardroom decisions are made in the summer. Personally, i’d hire a decorated, progressive or talented coach but the wider motivations in play at Newcastle may preclude such a move. After the shrewd removal of the Europa League from the forthcoming schedule and a frustrating yet somewhat inevitable Capitol One Cup defeat, a home game against Swansea was probably about as favourable a match as you could find to try and regain some kind of thread. Andros Townsend scored and it wasn’t a penalty; his goal was more Bale than baloney. Ryan Mason did too to thankfully remove the ‘next Andros Townsend’ tag he was seemingly earning for his high, wide and handsome back catalogue. But more to the point, Tottenham are slowly doing better things on the pitch, and when I say “doing better” I mean “shooting” and when I say “things” I mean “a lot”. This has been a recurrent criticism of Pochettino’s reign: the shooting numbers have been consistently average. At home, shooting has staged a resurgence! In the last 7 home games, Tottenham have shot over 20 times on 5 occasions, the other matches being the 0-0 against Utd and the 5-3 Chelsea game. In this period they’ve won five and drawn two. Twenty shots a game is Villas Boas territory and highly pleasing for the casual stats fan. Sure, they’re still conceding a) too many chances and b) too many goals and their away form has looked less impressive but with a clear run (yay!) and a game a week between here and May, they’ve at least given themselves a slim chance. And slim is better than none. 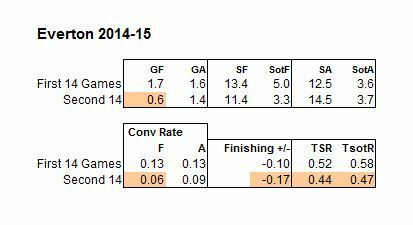 As a quick curio, I’ve compiled a table that breaks down the value of Finishing +/- into the goals for or against expected against what has been actually achieved. This is interesting because it tells us whether the attack or defense has been powering over or under-performance and by converting it into goals, hopefully, i’ve given a degree of clarity as to value of the level of performance. Man Utd have benefited at both ends of the pitch, they’ve scored more than projected and De Gea has saved more than expected. They are running very hot. Man City’s advantage is entirely borne from their attack. Everton and Newcastle have suffered defensive misery. Aston Villa’s problems are entirely offense based.